Starting in 1968, Ideal introduced the S.T.A.R.Team line of toys. The STAR stood for Space Travel and Reconnaissance. 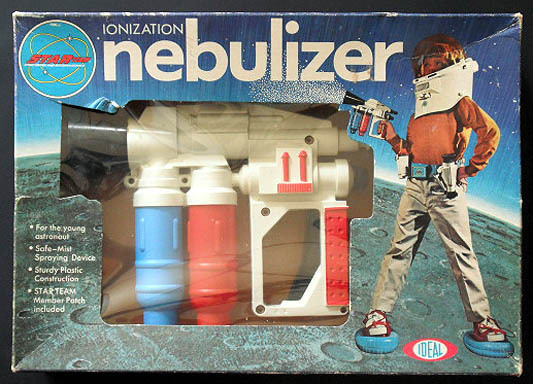 The first iteration of the line was a series of adventure accessories.Kids could play with everything from bouncing space boots, to a robo-gripper and a full utility belt of goodies. By the late 70’s, after a brief hiatus, the focus had shifted from moon landing inspired action toys to a line of Star Wars knock offs built from recycled parts, not that they were any less cool for being knock offs. It has been reported, but I’ve no idea if it is true, that George Lucas actually sued Ideal over the knock offs and lost because the STAR Team franchise pre-dated Star Wars. I love Lucas and Star Wars, but I’m glad he lost cause I love Star Wars knocks offs too. Despite the taint of Star Wars on a few of the STAR Team toys, the toys actually run the gamut from moon boots to board games and action figures. I didn’t have enough of these toys as a kid.